Last weekend I fulfilled a longtime dream… I dressed Leo in a Batman costume. I was inspired by Super Cooper’s Instagram page. The costume from Petsmart is a 2XL and it’s a little snug. Maybe after a couple of photoshoots, I’ll cut off the cape for Leo to wear separately and sew the Bat symbol from the front onto his ThunderCap. We took the Caped Crusader (and his sister, who doesn’t care for costumes) to the Dog Days of Summer event to raise money for the Whatcom Humane Society. He impressed us by jumping in the bobbing-for-tennis-ball tank. But then he had trouble getting out. Kind of an embarrassing moment for the Dark Knight. If you’re wondering about the sticker on Leo’s head, it’s a “fifth paw” bindi from Tails-a-Wagging. They give them out every year and give a prize weeks later to the dog who keeps it on the longest. Both our dogs’ bindis fell off by this morning. Every year that I do the A to Z Challenge, I will be for Isis. My beautiful doggie, Isis, was named for the Egyptian goddess and protector of health, marriage, and wisdom. Whenever you hear about the other ISIS, think about how many women and girls (and dogs and cats and ferrets) are named Isis in the world, and consider using the term ISIL like our president does. I’m enormously proud of my book about Isis, called Bark and Lunge. I also think I made a prophetic decision to change the original subtitle, which was The Isis Story and used to be in the URL for the book’s website. While that change was for the best, I still sing out her name with pride and wear it tattooed on my foot. J.K. Simmons in Growing Up Fisher. I hope he told his doggie costar “Good Job” once or twice. From Dogster. Have you seen Whiplash? Remember what J.K. Simmons’ character says about the phrase “Good Job”? I’ll let J.K. tell you, using some colorful adult language, so I can stick with my goal of using all positive language. I rather enjoyed Whiplash and this scene sums up its theme. Maybe that is how a great artist becomes One of The Greats. Leo jumped onto this raised dock in a parking lot with just a little encouragement, and you bet I cheered him on. “Good boy!” I gave him cheese. Mia hopped right up beside him and was happy to be rewarded with her rubber ball. Would throwing a cymbal at Leo’s head help him jump onto the next metaphorical dock he encounters? Or will he remember how good it felt to make his people so proud they smiled and cheered and gave him cheese? For the A to Z Challenge, I’m using all positive language in my posts. Find out how I discovered the benefits of positive reinforcement training in my book, Bark and Lunge! After checking out some of the other A to Z Challenge bloggers, how about visiting some Wordless Wednesday blog hoppers and telling them “Good Job”? After Kurt Cobain killed himself, one of my mom’s college students said she was so distraught that she couldn’t turn in her assignment. As a college student myself at the time, I thought that was a pretty shoddy excuse. I mean, light a candle outside your local record store, listen to Heart-Shaped Box on repeat, but do your damn homework. It’s not like you knew the guy. He was a tortured artist after all. His untimely death was sad, yes, but hardly a shock. Heath Ledger’s death a few years ago, on the other hand, was shocking. Like Cobain, he left behind a young daughter. He wasn’t a known drug addict, but if the stories are to be believed, I can see how he could have accidentally overdosed on prescription drugs. I learned of Michael Jackson’s death while checking my email in the Tokyo airport. I may have said, “Oh my god” out loud. Unexpected, but not beyond belief. Brittany Murphy. Corey Haim. Lots of stars die suddenly. Last Saturday night, I got into bed feeling bummed out about the state of a world where a young man can be killed legally for wearing a hoodie (Even if Trayvon Martin did pummel George Zimmerman and smash his head on the sidewalk, didn’t he have a right to stand his ground?). Another news alert popped up on my iPod: Glee actor Cory Monteith found dead in a Vancouver hotel room. I actually gasped. I know I said “Oh my god” out loud. Just a few days earlier, out of nowhere, I told Rob about Monteith. Obviously, I didn’t know what I was talking about. My ignorant assumption was based on his squeaky clean appearance. The fact that he was dating costar Lea Michele, and she was standing by him, proud of him for taking this step. I had googled him to see what he was being treated for. Vicodin? Maybe cocaine? I couldn’t exactly picture him shooting heroin at a Glee cast party. Or smoking meth while Lea warms up her vocal chords. I couldn’t imagine him being a serious enough alcoholic to warrant a stint in rehab. Is that why I’m particularly broken up about his death? Is that why, when I saw the news alert yesterday that the cause of death was a lethal combination of heroin and alcohol, my insides clenched from the tragedy of it all? I’m a Glee fan, yes, but Finn Hudson was never my favorite character. If they’d written him off the show for other reasons, I wouldn’t have cared. I am a Lea Michele fan, though. That girl can sing anything. I found myself hoping the couple had been having serious problems, as though that might make the loss easier for her. My heart breaks to think that at the time of his death, she thought everything was going great, that her boyfriend was clean, and she’d talk to him later that day. I guess it would be worse if they’d had a terrible fight, and that’s why he decided to get some heroin. Either way, how does a person begin to get over it? At one of the lowest points in my life, after Isis died, Glee made me smile. Lea Michele specifically. Her performance of Firework, which I later downloaded, filled me with just enough optimism to know that I would feel whole again. FIREWORK – RACHEL | GLEE from christianjn on Vimeo. Here she is singing with Monteith. Probably not a song that will cheer anyone up. Leo reads Mia a story about a brave German shepherd named Maggie. 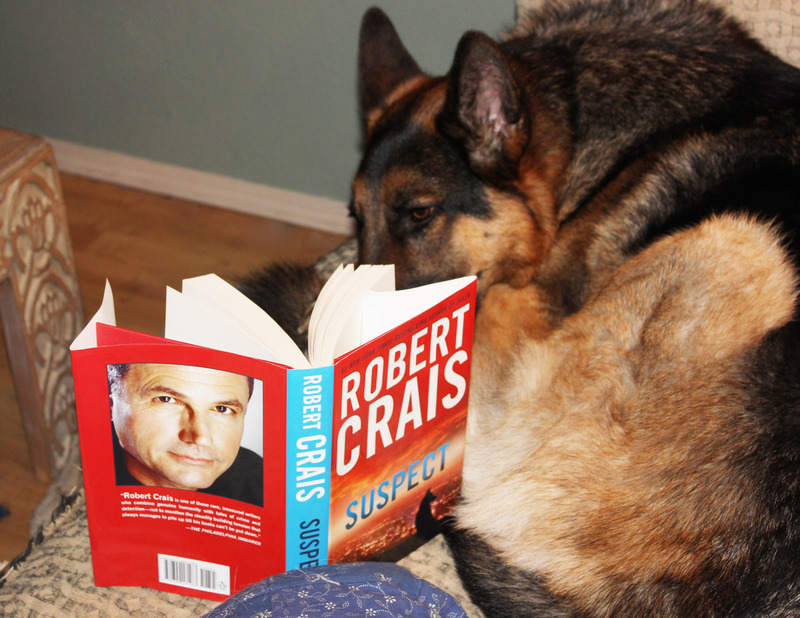 Just finished Suspect, Robert Crais’ best work! 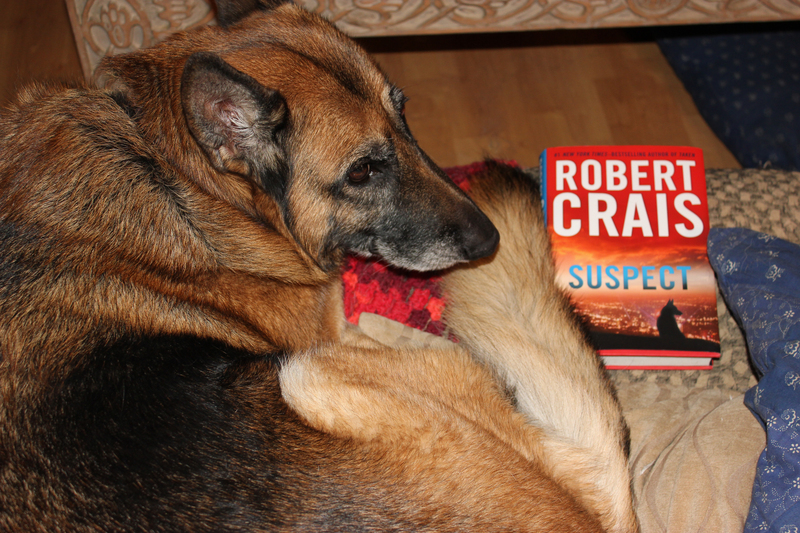 Obviously, I’m biased, because it’s about a German shepherd. My mom introduced me to Crais’ Elvis Cole detective novels many moons ago. I’ve read them all and the standalones as well. They’re terrific. This one really spoke to me. Not just because it’s about a dog. I’ve read a loooot of books about dogs the past several years. I have extremely high standards for dog books. Suspect is the yin to the yang of my memoir about Isis. Remember the other day when I said I should be reading stuff that contributes to my growth as a writer? I was all set to read Dora: A Headcase when I got a box of books from my mom in the mail. Both my mom and my stepmom told me I’d love Suspect, because it’s about a dog, so I thought I’d just whip through it before I got back to my “serious” reading. Remember the other day when I said that whatever I’m reading is what I’m meant to be reading? Suspect is about a cop who lost his partner in a shootout, and a military dog who lost her handler to an explosion in Afghanistan. Some of the chapters are written from the dog’s point of view, but not in a cutesy way. Crais nails the way German shepherds feel about their people. (I know, because Isis told me.) He also depicts so accurately what it is like to live with a German shepherd, what it’s like to drive with one sitting astride the console between the seats, scanning the view out the front windshield. Elvis Cole and Joe Pike are an extremely entertaining and compelling pair of detectives, but I can’t say that I relate to either of them. Cole is the self-proclaimed “World’s Greatest Detective,” after all. He’s a trifle cocky. And as much as I love Pike, he’s kind of a sociopath. So it was refreshing to read about inexperienced K9 Officer Scott James. I didn’t think this book would have anything to do with my work revising Bark and Lunge, but oh, how it does! Do you ever read a book and think, “That character is so totally me, if I had superpowers”? Or “if I were a princess” … or “if I were a spy”? Maggie, the German shepherd in Suspect, is so totally Isis if Isis had gone into the service. All of the things that Isis did that were scary, we see Maggie do as part of her job. 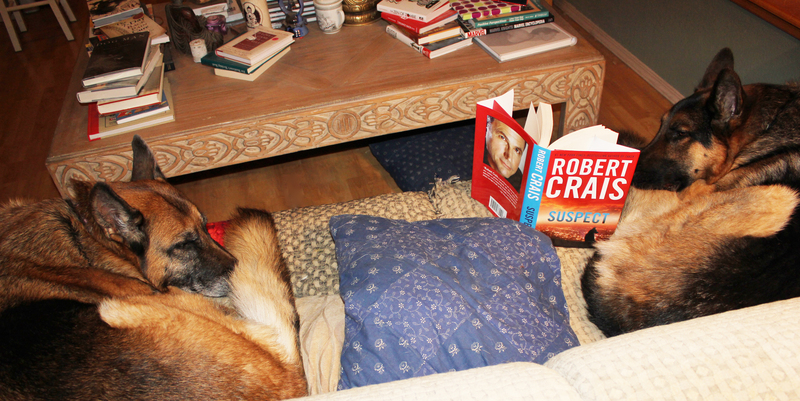 I loved reading another author – a suspense author – describe a German shepherd barking and lunging at a suspicious person, and how it feels to be on the human end of a German shepherd’s leash. Crais also does a masterful job conveying Maggie’s body language and how she alerts to smells. Early on, I wished there were pictures. I wanted to see Maggie beyond the silhouette on the cover. Turned out, I didn’t need photos, because she is written so well. (Also, I just imagined her looking like a cross between Isis and Mia). 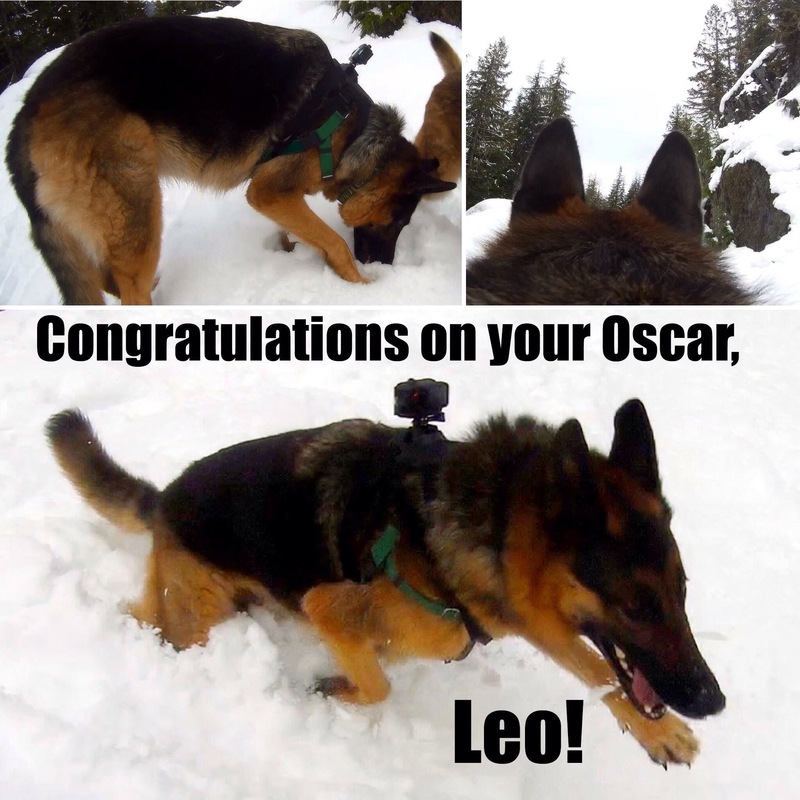 What a tribute to German shepherds. I hope this is the first in a series of Scott and Maggie books. My people like our Christmases dark, especially when it comes to the movie portion of our celebration. An all-time favorite Christmas Day screening was Quills, starring Geoffrey Rush as the Marquis de Sade. Two years ago, Black Swan was my favorite Christmas movie. During the past week at my mom’s, I read Gone Girl (Marriage can be a real killer) and watched the entire last season of Dexter (America’s Favorite Serial Killer). Warning: I am not about to spoil the ending of the movie as much as this interesting post, but if you haven’t read the book and want to remain spoiler-free, skip the next couple of grafs. I don’t think what I’m about to write will actually ruin the MOVIE for anyone, but I’m more sensitive to spoilers in books, it seems. I didn’t like the ending of The Life of Pi when I read it. It felt like an “it was all a dream” cop out. Armed with this information when I saw the movie, I saw an early clue that Pi might not be a completely reliable narrator. Which might lead one to believe that he exaggerated other parts of his tale. Cut to the ending, when Pi asks his listener which version of a story he prefers: the whimsical and improbable one, or the more likely, sadder one. Everyone likes the improbable one better, right? Interesting. Both stories tell of overcoming incredible adversity, but the improbable one goes down better. Like all those stories in the Bible? Like, probably Noah didn’t really have an ark with two of every animal on it? Is that what Pi is saying? Warning: For some reason, I assume that anyone who wants to see Les Miserables already knows who lives and dies, so there be spoilers ahead. I mean, wow. That’s powerful. So we know that Valjean believes in God, and without that belief, he never would have overcome his horrible adversity. For sure I believe in Valjean’s belief… but does that make me believe in God? Again. Wow. GoodReads tells me that’s straight from the source material. But really, here’s what does it. As miserables as their lives are, people’s prayers come true! You know what else these movies have in common, besides God? Yep. Tigers.